Transylvania’s medieval heritage is one of the most the most valuable from Romania. 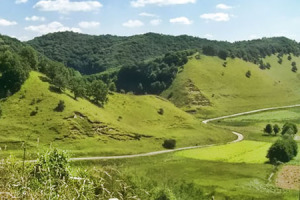 South Eastern Transylvania is also one of Europe’s most important natural and cultural landscapes, supporting rare habitats and fauna and flora species in Europe. The landscape is a mosaic of oak and beech forests, rich meadows and pastures. The small Transylvanian villages centered on fortified churches are still keeping the same level of civilization. We are inviting you to discover the amazing world of Transylvanian fortresses and churches, included in UNESCO World Heritage. The Saxon people defended their rich villages during the Middle Ages by building enormous fortresses around the churches. These unique historical sites are still preserved today. 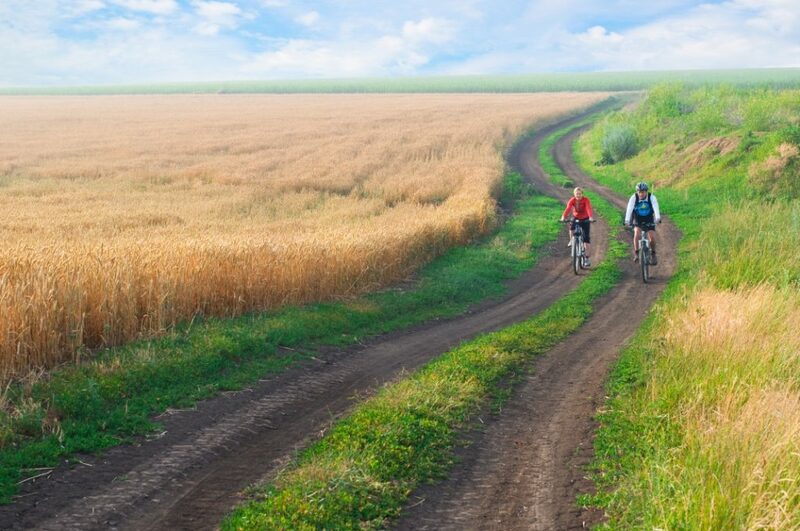 This trip brings you along country roads and pastoral landscapes far from the crowded routes, on flat terrain, unpaved country trails, up and downhill trails enjoying the incredible Transylvanian scenery. Specialized guide accompanies and assists you with technical problems and will give you all tourist information about the area, as well as bringing you in contact with the local people. We will be expecting our guests from noon onwards in Brasov/Kronstadt for a short tour in the old centre of the city, a beautiful medieval city, famous for the Black Church and other sites. Accommodation at Ramada 4* or similar/ Brasov. After breakfast around 9.00 am we will start our biking trip and leave Brasov on the north route to Bod, following a secondary route for 23 km. Our first stop will be in Feldioara, an old village close to Olt river. On the way, we will be visiting the beautiful fortified churches of Feldioara, Haghig, Belini and Aita Mare. From Feldioara we are cycling along the Olt River for another 28 km, to Miclosoara. An old medieval renovated house of Count Kalnoky will be our final destination for this day. Here you will be invited for accommodation in a splendid Middle Age house with a beautiful restaurant. Miklósvár is the oldest documented settlement of the region. Its castle was first mentioned in 1211 AD as border fortress between the territory donated to the Knights of the Teutonic Order and the rest of the of the Kingdom of Hungary. Today’s castle was erected in the 1500s as a hunting manor for the family and still contains many Renaissance elements such as painted wall decorations. It was abandoned the last fifty years and is currently under restoration. The Kálnokys are one of the most ancient families of Transylvania. The current 25th generation came back after 50 years of exile in the West and is now reshaping their lost heritage. Accommodation at Kalnoky Gueshouse in Miclosoara. After a medieval evening and a refreshing breakfast, we will continue our route along Olt River. After 10 km going into the North, we will follow the river to the West for another 13 km. In Racos we will find one of the last active volcanoes in the area and a stone quarry. After additional 15 km, we will reach Rupea and visit another important fortified citadel. Once in Rupea, we will continue our route via Dacia to Viscri, a beautiful World Heritage site. Viscri is a small settlement in the heart of Transylvania, where you can discover ageless traditions, legends and faiths of its people, while enjoying the architecture and savoring the richness of its craftsmanship and cuisine. Here we will explore the UNESCO heritage fortified church, we will make a tour of the garden and the courtyard activities, visit the village shop and blacksmith. Accommodation in Viscri in traditional renovated medieval houses. We will leave Viscri towards Messendorf via Bunesti, on a cycling tourism route. The view from the tower in Messendorf is one of the highlights of a visit in Tarnava Mare area. It gives a clear understanding of the layout of the Saxon villages and stunning views of the surrounding countryside. From Messendorf we will travel to Sighisoara by bus and stop in Saschiz to visit the Church, another World Heritage site. The famous magnificent bell tower, whose church was built in the 15th century, dominates Saschiz. On the hill above Saschiz is the Peasant Citadel, built by the Saxons probably on the site of a former Roman fort. The citadel is great place for a picnic lunch and an excellent photographer’s vantage point. 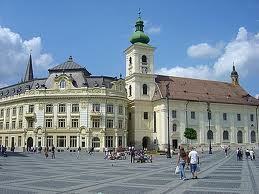 We will arrive in Sighisoara in the evening to have a tour of the beautiful old citadel. Sighisoara is recognized as one of the best-preserved medieval towns in Europe. The old fortified town lies on a small hill, dominating the lower town. Guests will be accommodated in the old citadel of Sighisoara. Accommodation at Cavaler Hotel 4 * sau similar/Sighisoara. After having breakfast around 9.00 am we will leave Sighisoara and start our cycling trip. On the way we will visit the the beautiful church from Malancrav. The village of Malancrav is very well preserved due to its isolated location, 13 km down a wooden valley, in the heart of Tarnava Mare. The Lutheran church set on the hillside above the village was built in the 14th century and houses the oldest entire altarpiece still in its original location in Transylvania.From Dumbraveni we will cycle around 13 km to discover one of the most beautiful remote villages of Transylvania, Cund, a small village where the German community renovated the old houses, bringing 3-4* luxury life in this hidden part of the world. It seems as the village is being brought back to life in perfect harmony with the old traditions of the place. Accommodation in the renovated houses of Cund. Today we are going to visit one of the most well known fortified churches included in the UNESCO World Heritage, Biertan. Biertan/Birthaelm lies at the western side of the Tarnava Mare region and is a key visitor attraction. The village of Biertan is one of the oldest settlements in Transylvania and it was first mentioned in 1283. It has an impressive heavily fortified gothic church with Renaissance elements in the centre of the village. For about 300 years it was the seat of the Lutheran bishops. Leaving Biertan we are going to pass first Atel village and the village of Brateiu, known for its 14th century fortified church. Picnic lunch in Mosna, in a bio farm well known for the cheese they are producing. At the end of the day we will reach the city of Medias. Originally an Iron Age and then a Roman settlement, Medias was a predominantly Saxon town for many centuries, walled and with gate towers, two of which remain on Strada Closca. In 1918 it began to develop an industrial and Romanian character, stemming from political changes after World War I and the construction here of Transylvania's first gas pipeline. However, a fortress, many churches and museums remain and worth paying a visit. Accommodation at Greweln Inn 4 * or similar/Medias. Is the last cycling day, but also the longest cycling path. Today we will be cycling to one of the most important cities in Romania and the Cultural Capital of Europe in 2007, Sibiu. On the way, we will stop to visit the fortified church in Tapu and Ocna Sibiului resort. Ocna Sibiului, an old resort with salted waters is currently being renovated and might be an option for spending some bathing time and the lunch here. Accommodation at Ramanda Hotel 4* or similar/Sibiu. Farewell dinner. In the morning we have plan a city tour (visit the Old Town, the Medieval Fortress, the Brukenthal Museum) and a short sightseeing trip to the open air village museum Astra. The museum is built around 3 lakes in the Dumbrava Forest and exposes houses, churches, water- and windmills from all over Romania. After the visit, depending on the participants’ time, we can have a cycling trip to the villages Cisnadioara and Rasinari. End tour. For groups of more than 15 participants, the price will be adjusted according to the number of participants.